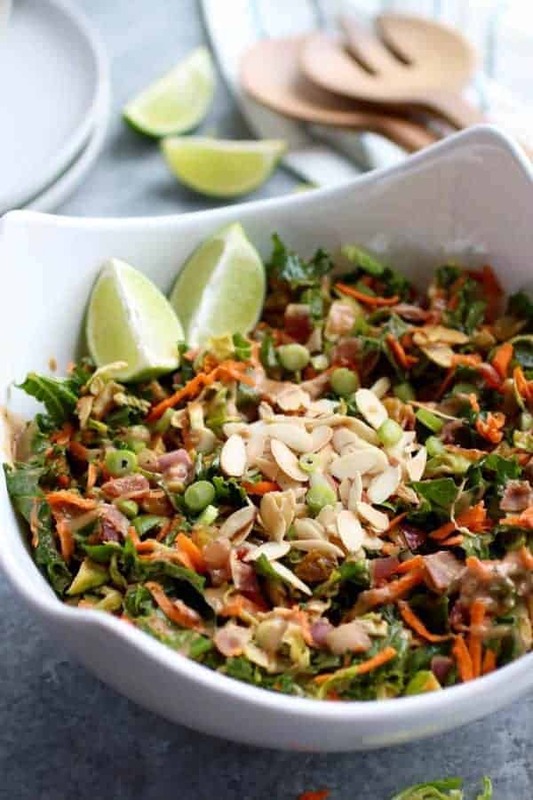 Shredded Brussels & carrots, chopped kale, crispy bacon, sweet golden raisins and toasted almonds come together in this BBQ Ranch Chopped Salad. This post was created in partnership with our friends at Tessemae’s. Tossed with a dressing made of Whole30 Approved BBQ & Ranch, this flavorful salad will make a tasty addition to your upcoming potlucks and grill-outs. Even though Old Man Winter has plans to make another appearance this weekend in Minnesota possibly dumping more than 12 inches of snow in some parts of the state, I’m still craving all the salads. AND I’m really craving warmer weather and sunshine but that’s out of my control. What is in my control is this BBQ Ranch Chopped Salad and making it 4 times in the last month. Yeah, it’s that good! It comes together rather quickly, is chock-full of nutrient dense whole foods and and is made with less than 10 ingredients. If you’re not a kale lover, please don’t turn your nose up just yet. 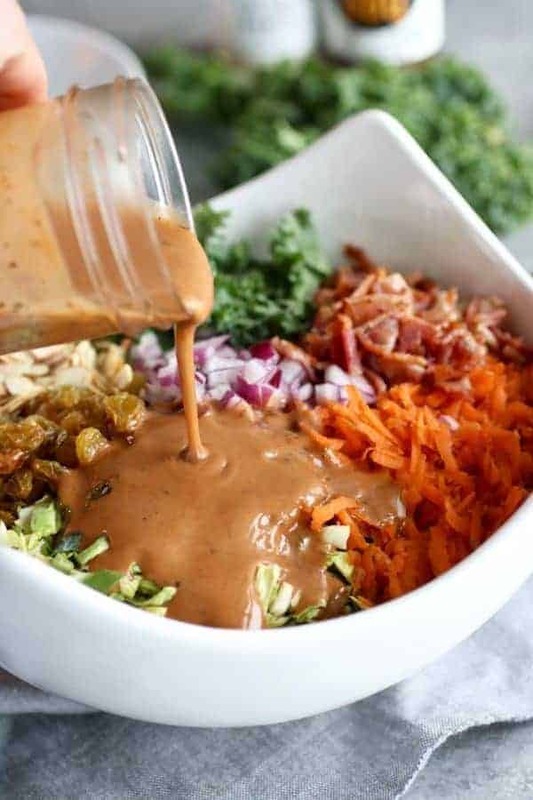 This salad may just turn you into a kale fanatic and before you know it you’ll be hash tagging #kaleyeah Okay maybe not…but everything is better with bacon, right?! Another perk of this salad is that most of the ingredients you can prep the day before. So if you’d like to make it really easy on yourself, I recommend you tackle the following tasks ahead of time: de-stem and chop the kale, shred the Brussels and carrots (if not purchasing them pre-shredded that is), dice the onion, cook the bacon and chop, toast the almond, measure out the golden raisins and lastly make the dressing (which is super simple and comes to gather with just a couple of shakes in a mason jar). Then, in a big container, combine but do not mix the kale, brussels, carrots, red onion and bacon (if it’s cooled). Place in the dressing that’s in the mason jar as well as the salad in the fridge. Right before serving the BBQ Ranch Chopped Salad, simply add the almonds and golden raisin and toss with the dressing. Top with the optional green onions and extra almonds and BAM…salad is served! Speaking of dressing! 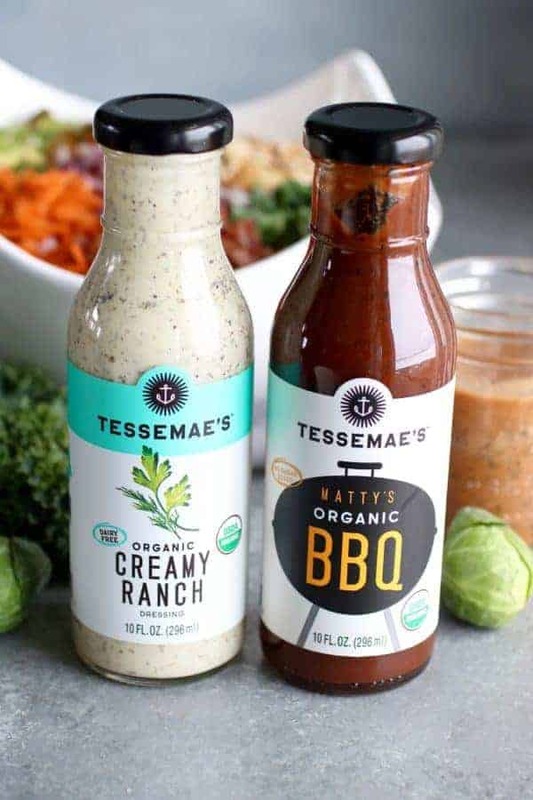 The dressing is made simple by combining Tessemae’s Organic Creamy Ranch and Tessemae’s Matty’s Organic BBQ. If you’re short on time or looking for convenience, let Tessemae’s come to the rescue. Tessemae’s dressings and condiments are 100% Real Food Dietitian approved. They’re made with organic ingredients and available in all sorts of flavors. If you’re Whole30’ing, several of the Tessemae’s dressings and condiments are Whole30 approved. I recommend starting with the Whole30 Starter Pack for those of you interested in giving Tessemae’s a try! Here I show just how easy it is to prepare BBQ Ranch Chopped Salad. 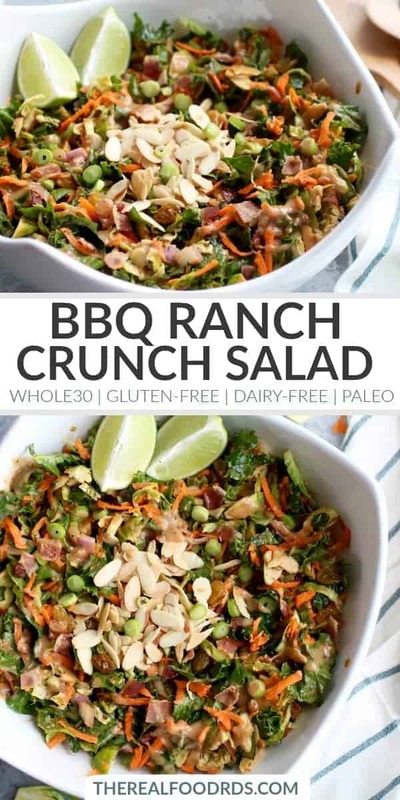 Based on my experience of making this BBQ Ranch Chopped Salad on four different occasions in the last month, I have discovered that due to the heartiness of the ingredients the salad keeps well and makes for tasty leftovers for I’d say at least the next two days. The only change is in the texture because the almonds soften a bit after absorbing the dressing. Add a little chicken, tuna, salmon, ground turkey, quinoa (if that’s your thing) and you’ve got yourself a lunch, a really tasty one! I also like to serve this salad over an avocado half for a delicious meal that’s full of healthy and satisfying fats. For those of you interested, I’d like to take a quick moment to highlight a few of these nutrient-dense whole foods found in this salad. Kale – when prepared properly, kale can be an incredibly tasty addition to your diet and contains a host of nutritional benefits. Brussels sprouts – in the same vegetable family as Kale (Brassicaceae family also known as cruciferous) and share a similar nutrient profile. Supports healthy digestion thanks to the fiber and a compound called Glucosinolates which helps to protect the lining of the digestive tract as well as a compound called sulforaphane which supports detoxification and can help prevent bacterial overgrowth from occurring in the gut. Carrots – we all know carrots are great for the eyes…but what else? 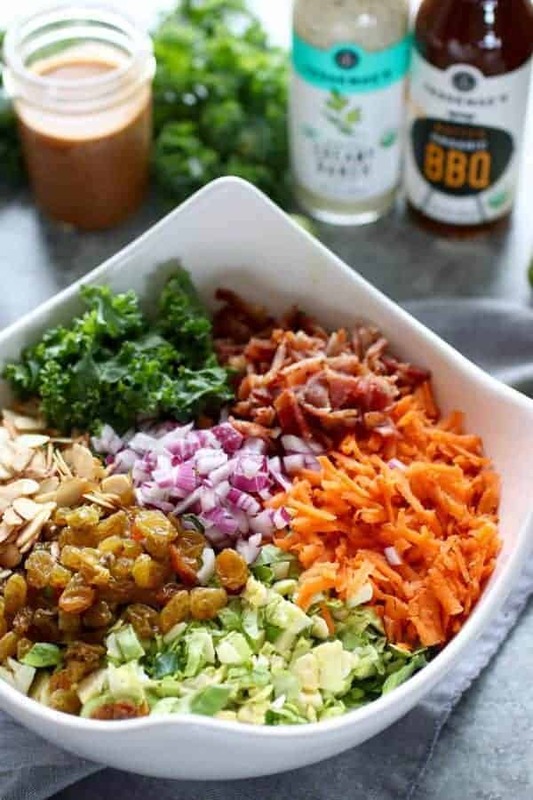 In short, BBQ Ranch Chopped Salad is incredibly nutrient-dense and full of all sorts of healthy goodness! So there you have it, a new salad to try at your upcoming grill-outs, potlucks or…just because it sounds delicious and you want to try! If you give this salad a try, please report back with how you like it and don’t forget to to snap a photo and post it on IG tagging @therealfoodrds and @tessemaes. We love seeing what you make of ours! 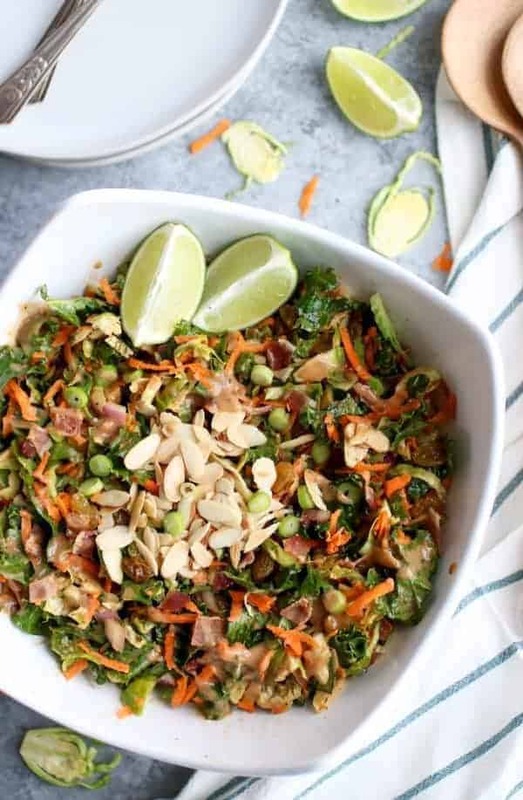 Shredded Brussels sprouts & carrots, chopped kale, crispy bacon, sweet golden raisins and toasted almonds come together in this Whole30-friendly BBQ Ranch Chopped Salad. Perfect for your upcoming potlucks & grill-outs and incredibly nutritious. In a mason jar combine the Tessemae’s Ranch and BBQ sauce. Place lid on tightly and shake the mason jar until dressing is mixed well. Set aside. To toast the almonds, place a small pan over medium heat. Add the almonds, toss often until nice and toasty and golden brown. Watch closely and adjust heat as needed to avoid burning the almonds. To shred the Brussels sprouts, trim ends and slice thinly with a sharp knife. 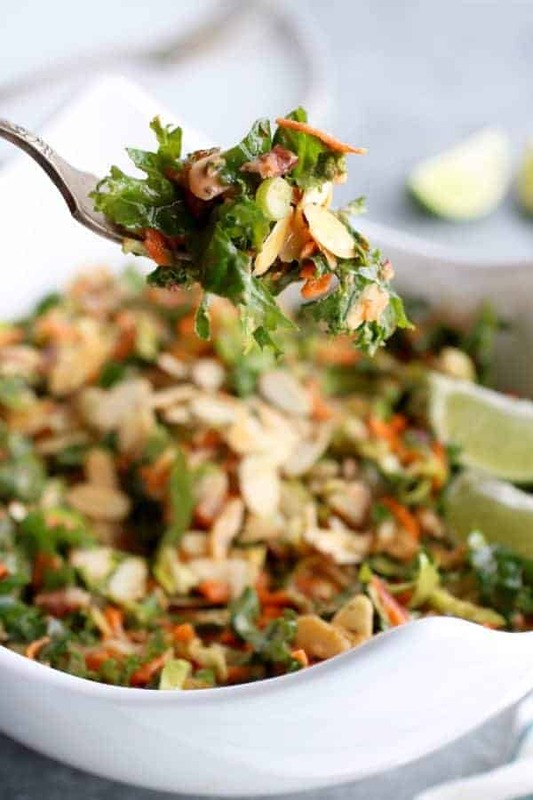 You may also use a food processor or purchase Brussels sprouts pre-shredded. 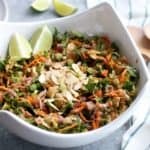 In a large serving bowl, combine all of the salad ingredients (except for the optional green onions and if you wish 2 Tbsp. of sliced almonds for adding to top). Pour the dressing over the salad ingredients and toss until evenly coated. Garnish with green onions and sliced almonds if you wish. What’s a good substitute did for the raisins? You could also use diced apple, chopped dates or dried cranberries. You’ll have to let us know what you end up using! This was great! Completely understand how it made it into rotation 4 times in one month. I’ll probably do the same. Took your advice and did all the prep work the night before. Had it along with grilled hatch chile marinated chicken. This is a perfect salad to take to a picnic or party. Thank you! Thank you, Kim!! Glad you loved it! We LOVED hearing this – thanks for sharing! This was so good! I printed it months ago and finally made it tonight. Hubby (known kale-hater) had seconds. I did shred the kale in my food processor and massage it for a few minutes in a plastic bag before I added it to the bowl. That really seems to help soften the texture AND the sharp flavor. I also used my own freshly-made Whole30 Dump Ranch dressing and added some thinly sliced radishes (leftover in the fridge). It was, again, just great. Thanks for posting this recipe! Made this without bacon (sad face) to bring to a vegetarian friend’s house for brunch. I also made it with Tessemae’s Balsamic instead of ranch and it is just as good, and fit in better with a brunch menu. Love it! Thanks. I love your substitution of balsamic for ranch – thanks for sharing that idea! Yeah, not having bacon is kinda sad but very sweet of you to accommodate your friend.